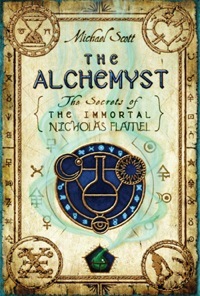 Nicholas Flamel and his wife Perenelle have lived nearly seven hundred years, thanks to Nicholas’s possession of the Codex, a book full of magical secrets like the elixir of life, the spell to turn base metals to gold…and the key to bringing back the old gods and destroying the human race. When Nicholas is attacked by his almost-as-ancient enemy, Dr. John Dee, and the book and Perenelle are both taken, Nicholas knows he doesn’t have long before the human race is wiped out by Dee’s masters, the Dark Elders. All Nicholas has on his side are Josh and Sophie, ordinary 15-year-old twins who didn’t mean to get mixed up in all this. But Nicholas suspects they may be the twins prophesied in the Codex, who may save the world…or destroy it.